Playmasters bring on the laughs with "Jake's Women"
Opening this Friday, The Playmasters at Neshaminy State Park in Bensalem bring "Jake's Women" to the stage. This Neil Simon favorite is brought to Bucks County through the creativity of director Ron Green and assistant director Catherine Tomasi. Harry S. Truman was in office, the Today Show debuted on NBC and Playmasters were formed in Bensalem. What year was it? 1952. Anyone who’s driven down State Road passed Neshaminy State Park cannot miss the sign. It stands at the side of the road bearing just two words “The Playmasters.” Residents who turn down the road and follow the sign to its end are in for a treat. 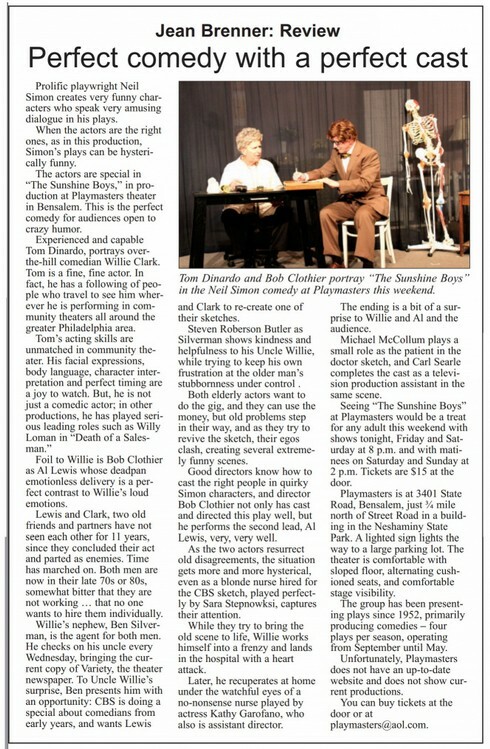 The Northeast Times wrote a wonderful review about us. The folks behind The Playmasters Theatre Workshop like to promote a family atmosphere.